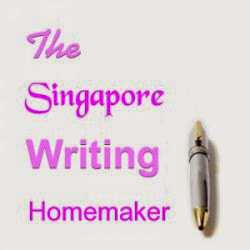 The Singapore Writing Homemaker: Why You Should Donate Your Baby's Cord Blood To SCBB? 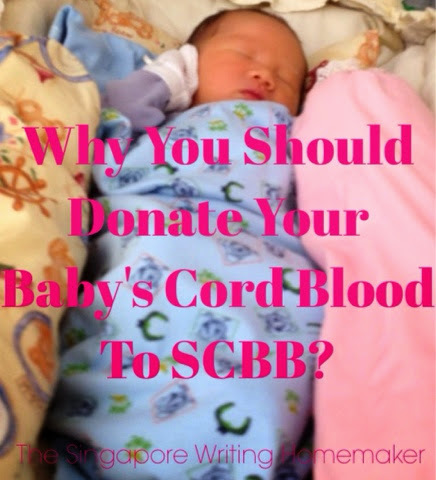 Why You Should Donate Your Baby's Cord Blood To SCBB? I donated my babies' cord blood to Singapore Cord Blood Bank for all four babies. Ms Nisha Binte Abdul Razak from SCBB contacted me and asked if I would be willing to speak for this cause. 1. How did you first learn about the Singapore Cord Blood Bank? E.g. through your doctor, friends, Internet, etc. 2. What motivated you and your spouse to donate your first baby’s cord blood? We didn't want our child's cord blood to go to waste and who knows, we may also be the ones who need it in the future. This does seems a little shallow but it is true. So do it for your babies as well. 3. Was there a particular incident or experience (personal or professional) that you have gone through that encouraged you to make the cord blood donation? No. None of our relatives suffered from illnesses which require cord blood. Thank God for that. So we had made the donation purely out of choice. It had been a good choice and we never regretted it. 4. Other than the above-mentioned reason, was there any other motivating factor during your second and subsequent pregnancies to donate cord blood? No. But it was very easy when my first baby donated his cord blood. The experience itself was not much added hassle that I did not mind to donate again for the second and subsequent pregnancies. Try it and you would know. Life is no regret until you live and try it out. 5. Did you and your spouse do research on cord blood banking prior to donating? No. We just knew that the cord blood would be stored for later use and it could save a life. Read Treatable Diseases for more reasons to do so. 6. Did you and your spouse consider private cord blood banking during any of your pregnancy? If yes, why did you choose to donate instead? Yes. We thought private cord banking would be added cost to bear given that we need to pay a fee to maintain. Besides, if the intention is to save a life, why bother with going private. 7. Why do you think it is important for expectant parents to know the different cord blood banking options (i.e. cord blood donation, private banking, discarding, etc.) before making a decision? They should know that donating to Singapore cord blood bank is quite different from donating to private bank in that they are not entitled to priority use if they are ever in need. This would be a major consideration in anyone's decision. And if you choose to discard your child's cord blood, it would be gone to waste. Our choice was to donate as the intention was to save a life. 8. Would you encourage your relatives and friends to donate? If yes, as a four-time donor, what would you say to your relatives, friends and colleagues about cord blood donation? Yes. We always believe in sharing. Sharing the children's cord blood is in line with what we believe in. We would highly encourage any mothers-to-be to be generous with their baby's cord blood. There is nothing compare to knowing that you and your baby might be saving someone's else life in the future. God blesses you with a baby and knowledge tells us that its cord blood is something unique and precious, we must not waste it by taking no action. 9. SCBB is a non-profit organisation and receives funds from charitable foundations and philanthropists. With their funding, SCBB is able to cut its operational expenses from the collection, processing and banking of donated cord blood, and make them readily available for those in need of transplants. Knowing this, what would you, as a cord blood donor, like to say to potential financial donors intending to fund SCBB? Please donate generously as we (the cord blood donors) do. Its mission is important. 10. If there is one word to describe your cord blood donation experience, what would it be? 11. Why did you choose that word? We are thankful for an organization such as SCBB exists so we could contribute our children cord blood for sharing.